Permits to pump up groundwater are issued increasingly less frequent. However, many companies require this water for their production process. They have to pay the bill or look for alternative water sources.The most sustainable alternatives are surface water or treated waste water. Surface water is purified water from a canal or river which can be used in the production process. This is what Citrique Belge had in mind when they approached PCA. Citrique Belge is a citric acid producer located in Tienen. They are responsible for approximately 10% of the total global production of citric acid. Their product is used as a flavour enhancer, increases the storage life of canned fruit and vegetables, and is an antioxidant for meats. They asked PCA whether the surface water of the river Gete could be purified to create useful process water of drinking water quality. The use of surface water is not only financially attractive, but also from an ecological point of view. 100% of the water used in the production process of this Belgian citric acid producer originated from groundwater. Each year the company pumped up 1.3 million cubic meters of groundwater to be used as process water. 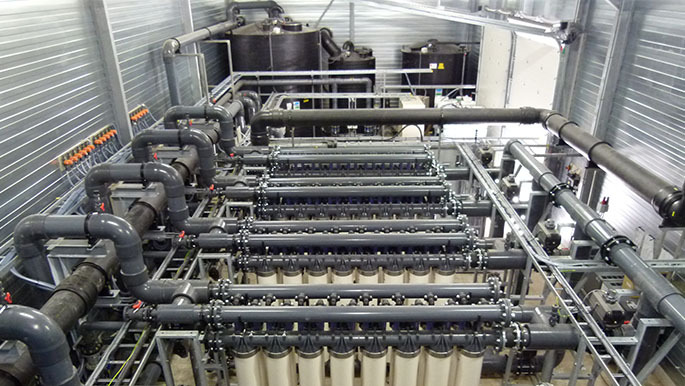 PCA came up with an easy-to-use turnkey solution in the shape of a water treatment plant with a capacity of 150 m³/hour. Pilot tests, detail engineering, 3D drawings, installation, cabling, automation, start-up and follow-up, etc., the entire process was carried out by PCA itself. Ultimately, the installation was constructed as follows: firstly a prefilter to remove any coarse particles. Followed by ultrafiltration down to 0.02 µm. Thanks to this very fine filtration process all suspended solids, but also almost all viruses and bacteria, are removed. After this ultra-filtration the water is further purified through active carbon and UV. The full scale installation works around the clock and makes use of the Siemens TIA Portal. This allows the programming and configuration of the PLC, the touchscreen and the drives in the same development environment, which saves a considerable amount of time. The installation works completely autonomous and requires a limited amount of manual follow-up. The entire system is automated: all pumps operate at a pre-set frequency, the valves open and close automatically, and the dosages are controlled in proportion to the flow. Such technologies can also be used to purify canal water or waste water into process water. In some cases, reverse osmosis or nanofiltration may also be required, but that depends on the application. Are the words ‘financial benefit’, ‘in an ecological way’ and ‘time-saving’ music to your ears? Then please contact us and discover a tailor-made solution for your problem.